Demonstrating the Maxwell Polaris Spirit Edmonton! The community focus of MaxWell Polaris is one of the company's longest standing missions. We are involved in fundraising as well as various community works in the Edmonton area. REALTORS® from MaxWell Polaris are giving back to the Edmonton community by raising money for the Edmonton food bank. 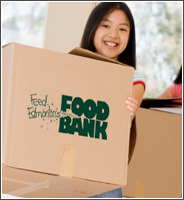 Each month, over 13,000 people receive hampers from Edmonton's Food Bank or one of the over 135 agencies, churches, or food depots with which we are affiliated. Each year, REALTORS® from MaxWell Polaris, participate in a polar bear jump and golf tournament in support of this organization. The outpouring of this MaxWell Polaris Spirit, improves the neighbourhoods of where we live, and nourishes our community roots. MaxWell Polaris is proud to support this essential service.